I finally received my Boxycharm box earlier this week and I couldn't have been more excited to open it. Once I opened it, however, I was not pleasantly surprised. I'm used to seeing cool or trendy products that I want to try! So besides the cool makeup brush and the Temptu highlighter - I looked at the rest and decided that I probably wouldn't ever end up using! Well, and I always hate admitting this, I was wrong. 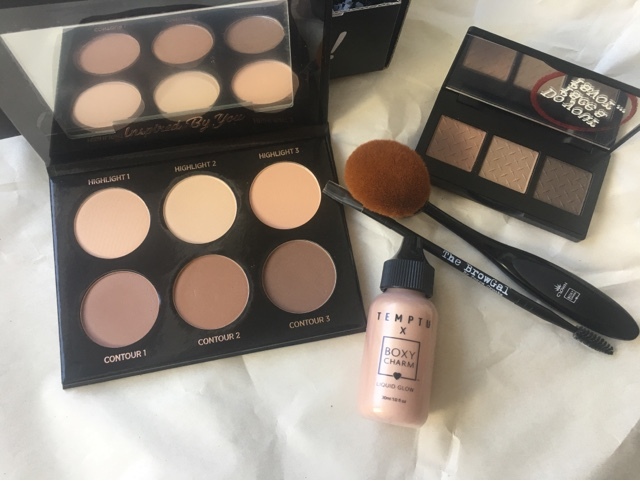 I've tried all the products except the highlight and contour palette - and I'm really pleasantly surprised at their performance. I will definitely be doing a review on the BrowGal products. I've tried their browgel before and I think this brand can be the next big "brow" brand. 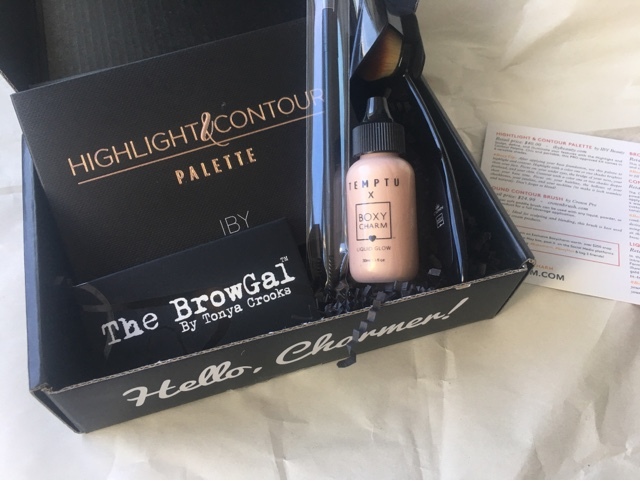 So this month's Boxycharm included the Highlight and Contour Palette by IBY, the BrowGal Convertible Brow in 02, BrowGal brush and spoolie set, Crown Brushes Round Contour Brush and the Temptu and Boxycharm collab liquid glow highlighter - which is a rose-gold liquid highlight you're supposed to apply with your hands. 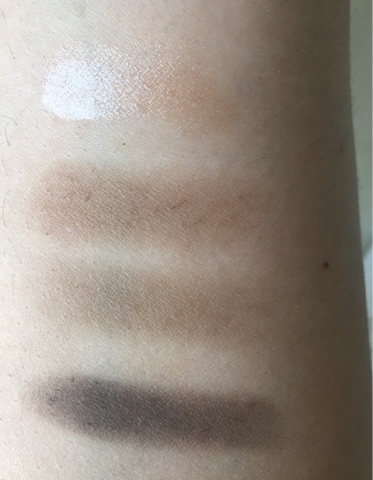 Top to Bottom Swatches: Temptu and Boxycharm Liquid Glow, BrowGal Convertible Brow in 02 warm shade, middle ashy shade, darkest brown shade. The swatches so far are actually great and the perfect amount of pigment for a natural look. You can definitely layer these products to create a more intense effect. This box was definitely put together to give you a defined but natural look - perfect for the awkward spring/summer period! What did you think of this months' Boxycharm?